After weeks of drill diagnostics and enforced lack of travel while those diagnostics were on-going, Curiosity finally moved last weekend (Sol 1553). 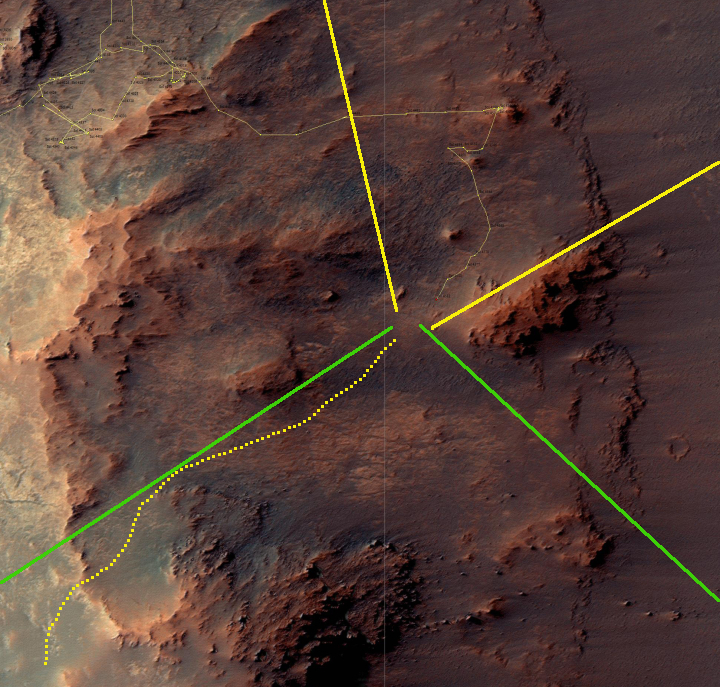 The traverse map to the right, cropped and reduced in resolution to show here, indicates where they went, which wasn’t far and doesn’t really tell us yet which route they plan to take to pick their way through the surrounding dune fields. Thus, the options I indicated in my November 14, 2016 rover update all remain possible. If you go to that update you can see a much better Mars Reconnaissance Orbiter (MRO) overhead image showing the upcoming terrain. In the meantime, the Curiosity science team is preparing to take a well deserved Christmas-New Year’s break (see update for sols 1566-1568). So that Curiosity doesn’t sit idle during that time, they have uploaded to it an 8-sol plan to cover December 22 to December 30 followed by a 3-sol plan from December 31 to January 2. The rover will not move during this period, but will take lots of different observations in situ. As they note rightly at the link above, “It’s been quite the year for our rover: we have drilled six holes, performed two scoops, driven 3 km, and climbed 85 vertical meters!” What is more significant is that the best is yet to come! 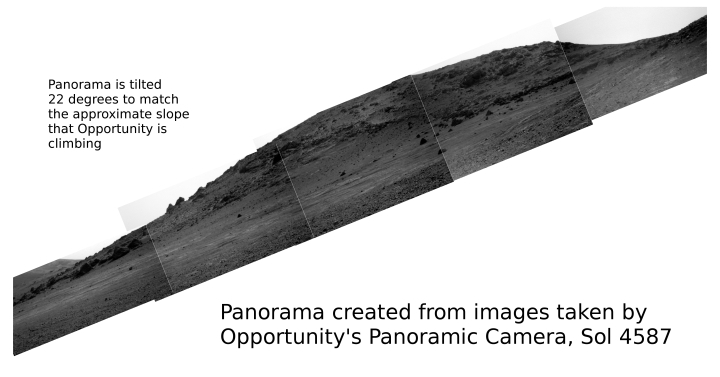 For the overall context of Opportunity’s travels at Endeavour Crater, see Opportunity’s future travels on Mars. Opportunity continues to weave its way south through the rough and steep terrain inside the rim of Endeavour Crater. The image below is a cropped and annotated version of the MRO overhead image, showing my approximate guess about where they are. It also shows the approximate views of the two panoramas below that, with the green lines indicating the view of the first panorama, looking forward, and the yellow lines indicating the view of the second panorama, looking behind. I must thank Bill Farrand of the Opportunity science team for giving me the approximate direction of the first panorama. You can see the rover’s tire tracks in the center of the second panorama, as well as the mounds that the rover has been visiting as it climbed up from Spirit Mound, which had been very close to the floor of Endeavour Crater. In the distance behind can seen the crater floor as well as the crater’s far rim, 14 miles away. The curve in the horizon is due to the angle in which the different sections of the panorama were taken. The first panorama looks ahead at the boulder field blocking the rover’s travels. It shows what the MRO overhead image fails to reveal, the incredible steepness of the slope. I think they plan to head to the right and up through the gap heading west and out of the interior of the rim, as indicated by the yellow dotted line. They will then have a much smoother path south to the gully they hope to explore on their way to the floor of the crater. 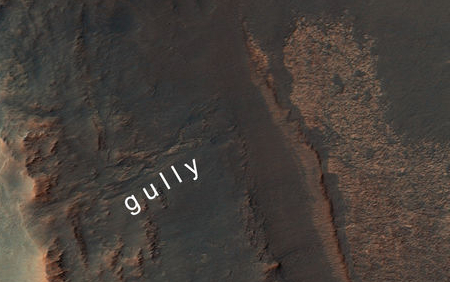 In previous posts, I had given the impression that the gully was merely a route into the floor of Endeavour Crater. This is not correct. While they will head onto the crater floor after visiting the gully, the gully itself is a significant target, as it appears from the MRO image of it to the right to be a place where water might have flowed into the crater. If so, the gully becomes a very important geological site for study. Wow, six holes, two scoops, 3 km, and 85 vertical meters is really a lot in year! No, serious (irony stopped). I am questioning the efficiency of the whole scientific process performed by the team and rover. That is an average “speed” of less as 0.1 mm/s. It looks to me that this team is over-cautious and looks for unnecessary project elongation, without delivering really new science or results. Mr. Zimmerman, please correct me. I believe the caution is warranted… this rover has a potential lifespan of 14+ years, it has had a few technical problems, so why rush into trouble when you have the time to stroll and avoid it? On a separate note… I would like to wish Bob, and all the readers of this wonderful blog a very merry Christmas and a happy and peaceful new year…. Alex: I disagree with you very strongly. They are operating a complex machine remotely from many millions of miles away. The machine has a design flaw in its drill that could cause it to short out the entire machine’s electrical system every time they use it. They are also beginning to climb a mountain, with the terrain becoming increasingly rough and difficult. They accomplished an amazing amount of work in 2016. Each time they use the drill they need to spend a lot of time preparing and then doing it. 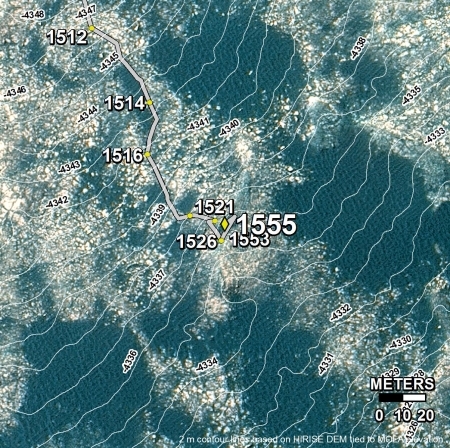 Yet, they still traveled 3 kilometers while drilling six times. It is quite reasonable to criticize, but here you are simply being unfair. It discredits you. Mr. Zimmerman: It was not by objective to hurt your exaltation or feelings for that rover. However, I, who is considering myself as a hard-core -“space-cadet” for 40 years now, become more and more bored by the Opportunity rover mission after initial excitement in 2012. It may be my fault, but the important scientific discoveries do not reach my awareness, despite I read your blog entries to the topic routinely. You may help me in this regard! Mary Christmas! Alex: You didn’t “hurt my exhaltation or feelings”. 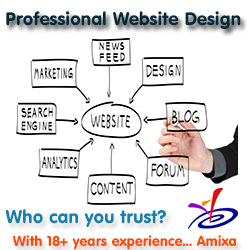 As you know from reading my webpage, I do not look at these things with rose-colored glasses. When thing go wrong or are being done badly, I say so, very bluntly. From everything I can tell, however, almost all the work being done by both rover teams has been good and worthwhile. I am going to credit them for this. And since everyone knows I am not afraid to criticize when I think it necessary, my complements here will be known to be completely sincere.